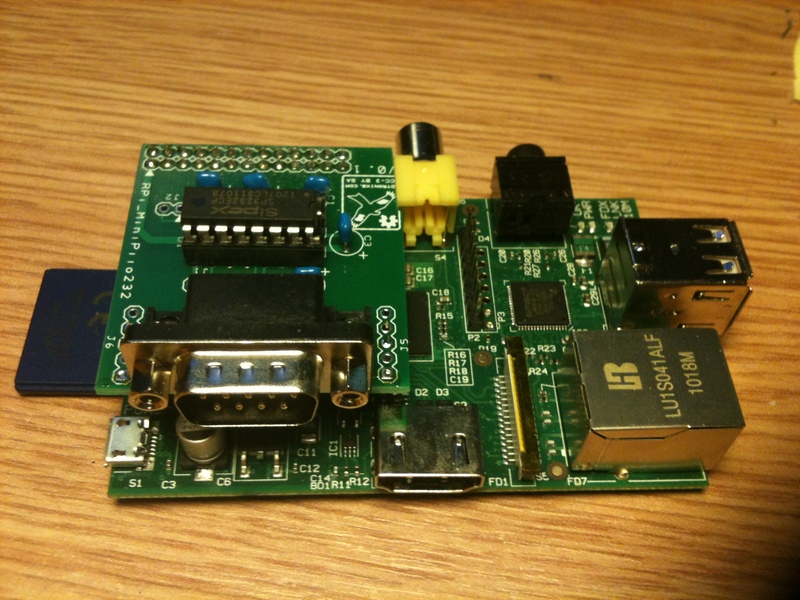 We replaced the previous RPi Protoboard (v0.2) design with this new board design. We’ve simplified the boards design by remove the 2.1mm power jack socket for using an external PSU wall adapter and the various jumpers and opted to use the Raspberry Pi’s own 5V supply instead. This means any circuit we build will be limited to the current we can source from the RPi supply but it should be good for up to 500mA with a decent wall adapter plugged into the RPi micro USB power socket. We also used surface mount components (hence the SM in the boards name) for all the components except for the connectors. 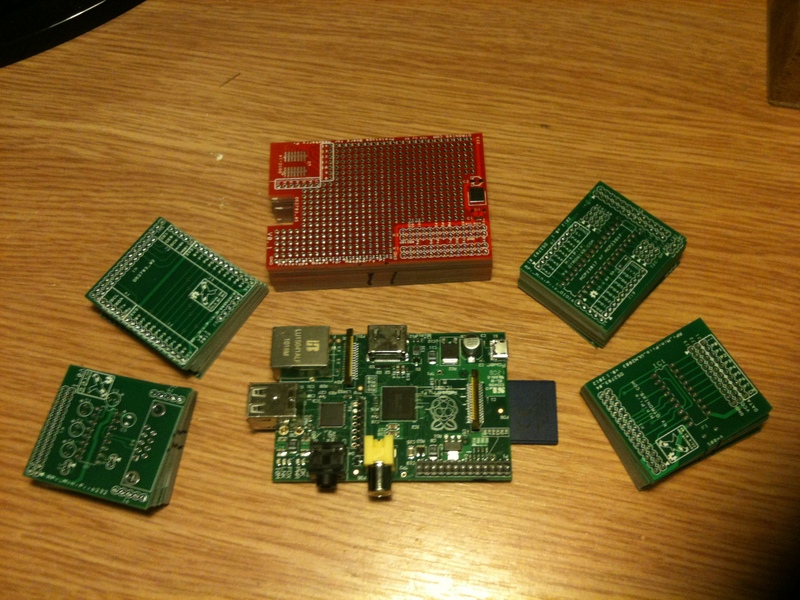 The third and final board we built from the batch of PCB’s we received on Friday was the MiniPiio_DIO16. 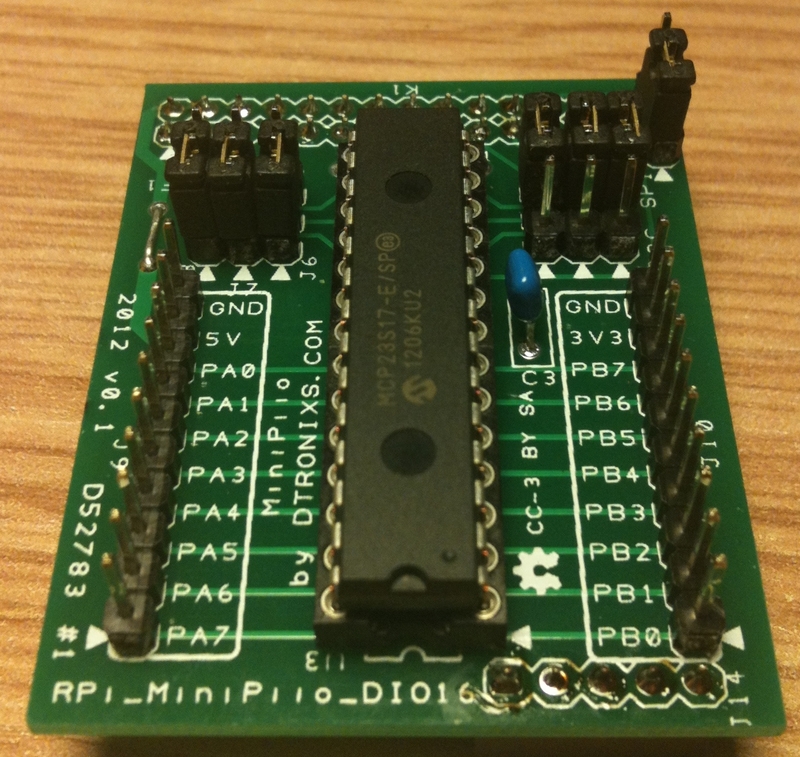 The MiniPiio_DIO16 is a 16-channel digital input/output add-on card for the Raspberry Pi. 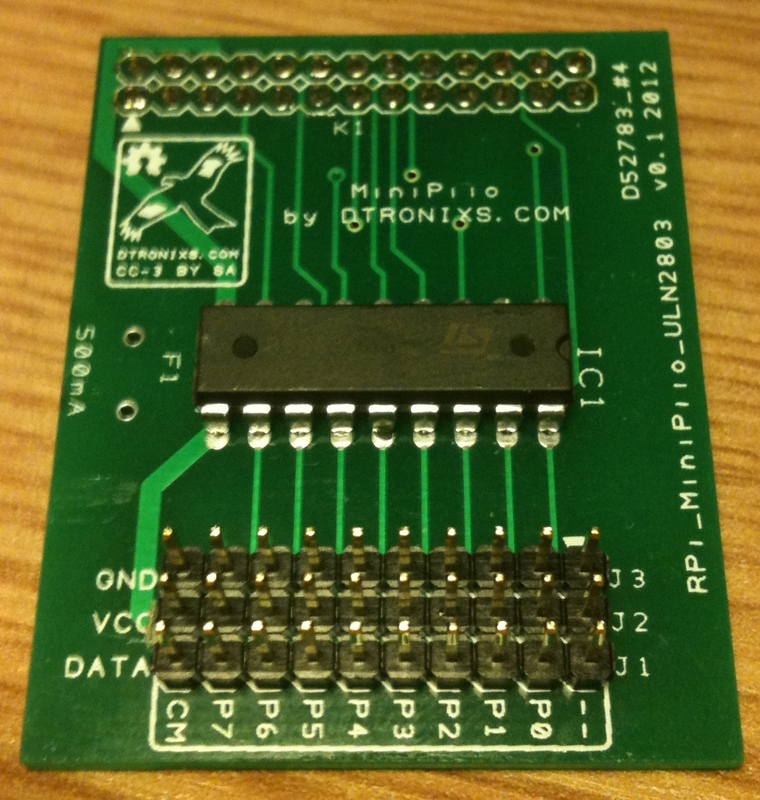 The board can use either a Microchip MCP23s17 (SPI) or a MCp23017 (I2C) Port Expander IC. The choice of chip is done by jumper headers on the PCB. In addition the I2C and SPI address is also selectable by jumper headers. 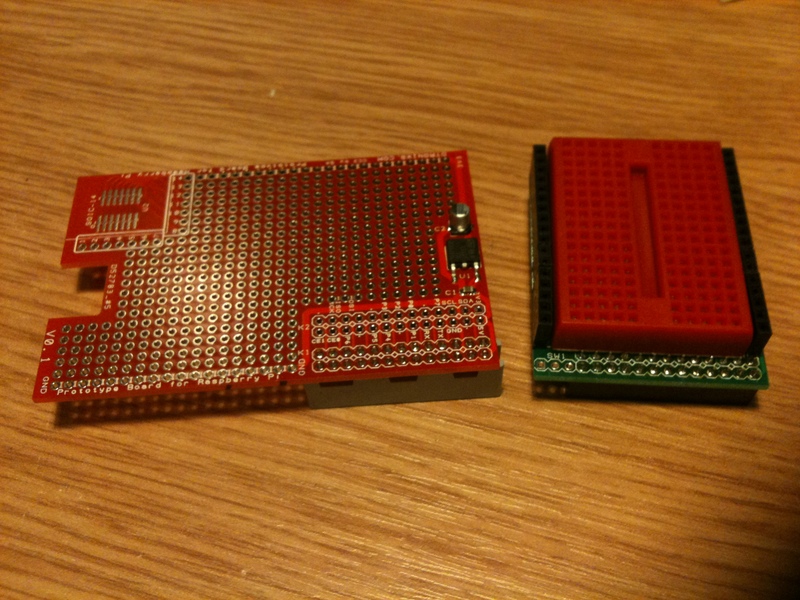 Finally, the choice of SPI Chip Select (SPI_CE0 or SPI_CE1) can ne made via a jumper header. By my reckoning thats 7 jumper headers. The I/O ports from the chis are brought out to two pin strips. As well as I/O each pin strip has a ground, while one has a fused 5V supply and the other a non-fused 3.3V supply. 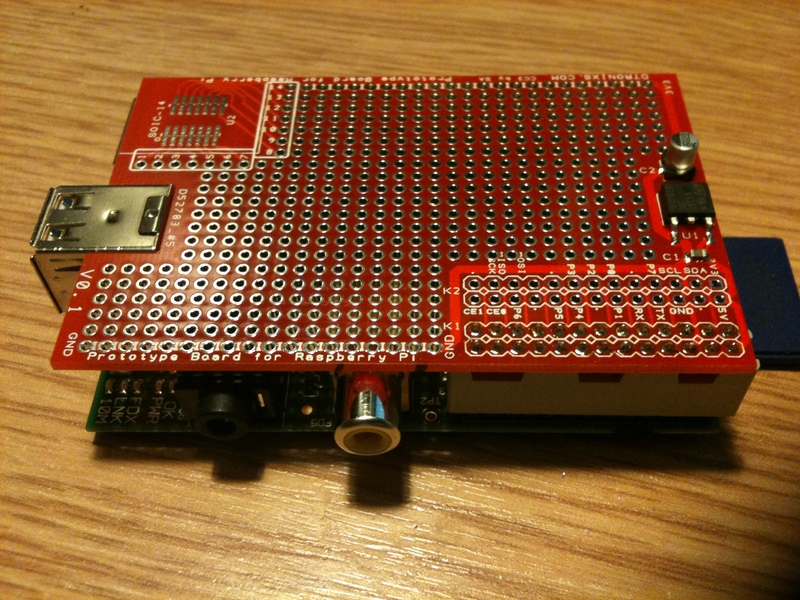 The second board we built over the weekend was the MiniPiio_ULN2803. From its name you can guess it’s a printed circuit board with a ULN2803 8-channel Darlington driver. The ULN2803 allows us to drive cicuits with significantly higher current (up to mA) then we could with just the Raspberry Pi GPIO pins alone. 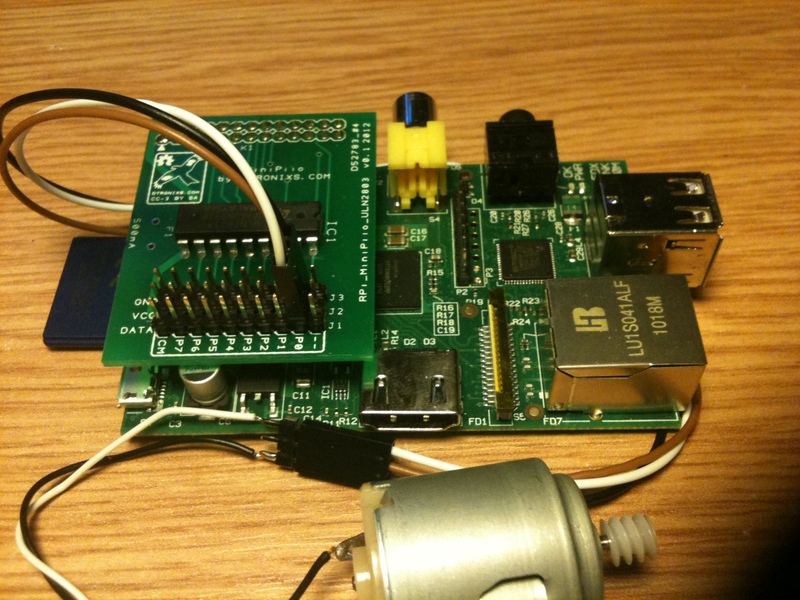 The GPIO Pins are connected to ULN2803 inputs, with the its outputs going to an array of strip headers laid out as servo pins. The board design was done in Design Spark PCB and a PDF for the schematics is here. As promised we spent our weekend building the other MiniPiio designs. 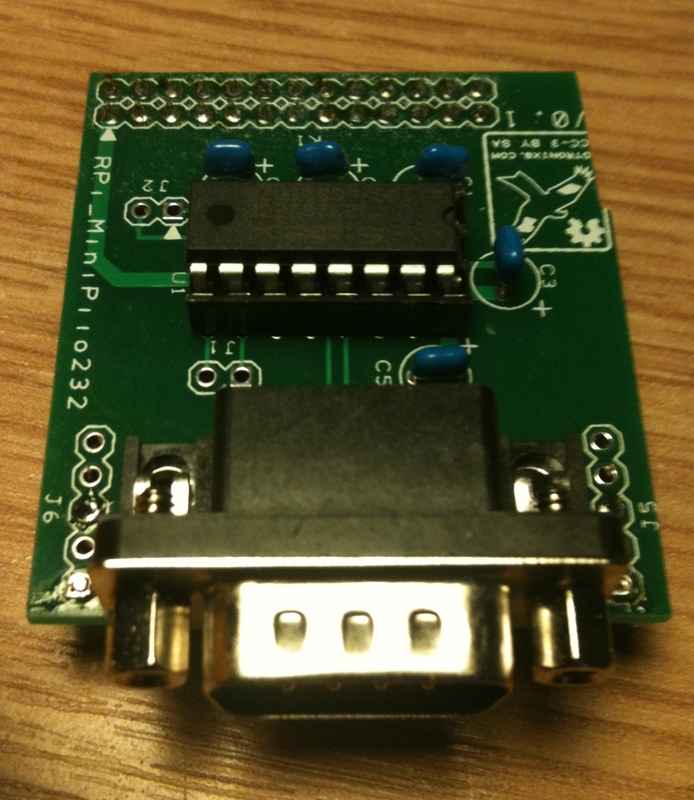 So without any further ado, here’s the MiniPiio_RS232. This is for anyone who wants a RS232 port on the Raspberry Pi but doesn’t want to give up one of the two precious USB ports or clutter their desk with a USB hub to use a USB to RS232 adapter. Unfortunately, there’s a mistake in the dimensions of the PCB. Instead of being 50 x 40mm like the other MiniPiio’s, the MiniPiio_RS232 is 45 x 42mm so its wider and shorter than the others. Being shorter is not a problem just ask Napoleon, but being wider does mean it interferes with the RCA Composite Video connector. 30-seconds with a file cuts it down to size but it does mean back to the drawing board or rather Design Spark PCB. It was easy to fix, but just means another trip to the PCB manufacturer for another batch of boards. A PDF for the schematics is here. 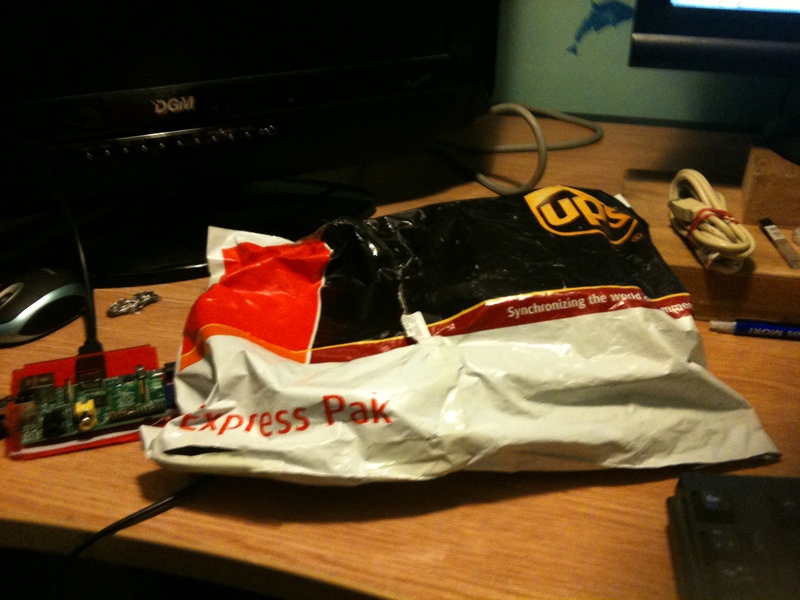 MiniPiio PCB board’s arrive at last ! We received our first batch of PCB’s from our manufacturer yesterday. In the package were 5 sets of blank PCB’s for the RPi_ProtoBoard and the first of the MiniPiio boards: MiniPiio_RS232, MiniPiio_DIO16, MiniPiio_ULN2803 and MiniPiio_ProtoBoard. We’ll get the rest of the boards assembled over the weekend and post them here. 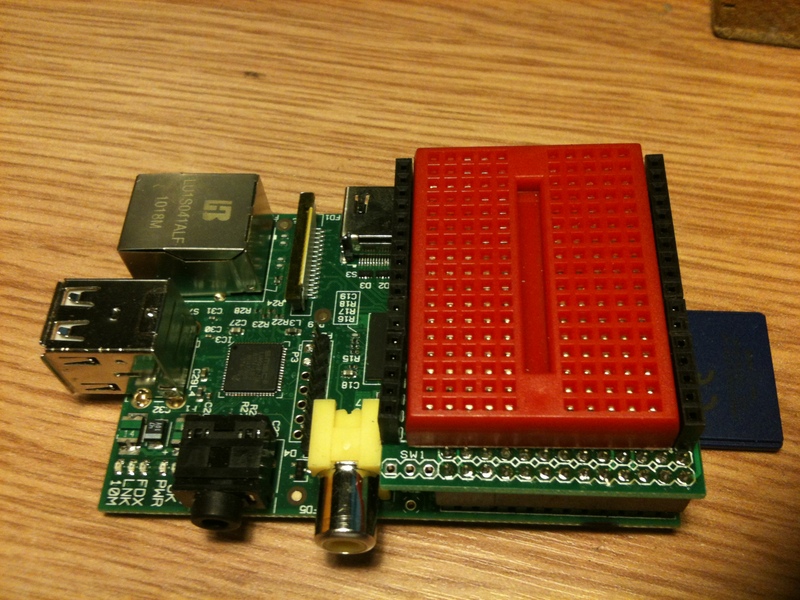 MinPiio (or MiniPi I/O) is a name given to a number of small add-on boards designed for use with the Raspberry Pi. 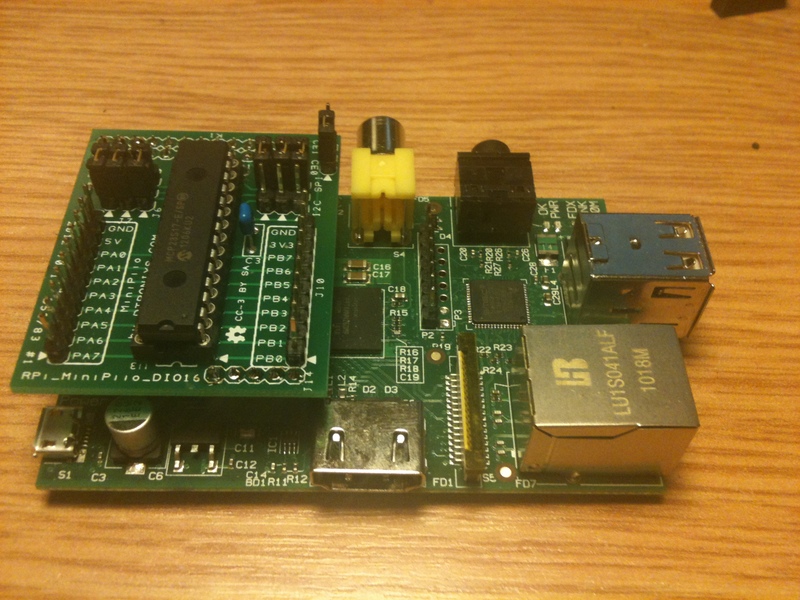 Each board measures a small 50mm x 40mm, connects to the Raspberry Pi’s expansion header and does a specific type of I/O. Boards being built as we speak include a RS232 interface, mini prototyping board, 16ch Digital I/O board and a high current Digital Output board. Other boards in the pipeline include a CAN Bus interface, RS485/DMX512 Interface, Relay Board and a thermocouple board. You are currently browsing the Zuzebox's Blog blog archives for June, 2012.